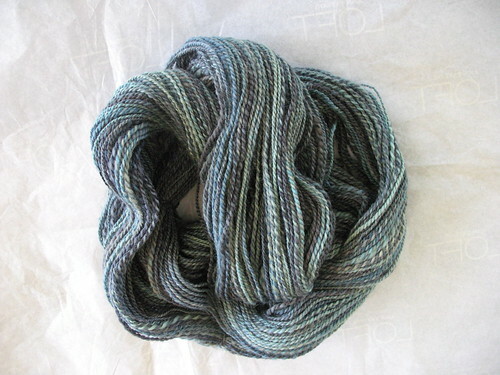 This is 100% Wool (label doesn’t say what kind of wool) from Knit One Spin Two. 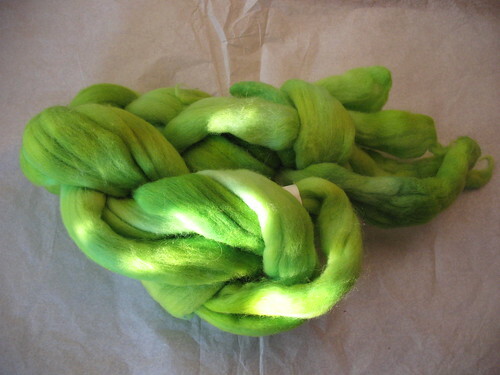 Although the natural BFL I showed in my last post was easy to spin, the bright green color of this roving could be seen clearly which makes it perfect for the beginning spinner. I know personally how much it helped me spin more consistent singles. 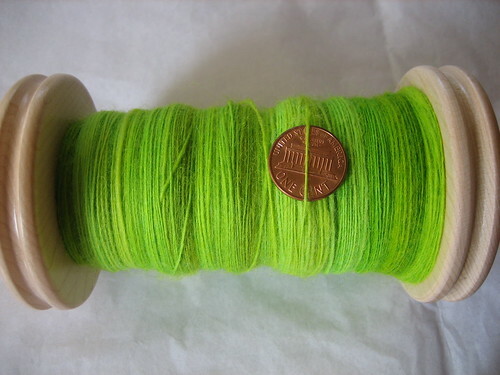 I’ve only spun one bobbin of this and I think I may use it a practice to try Navajo Plying. 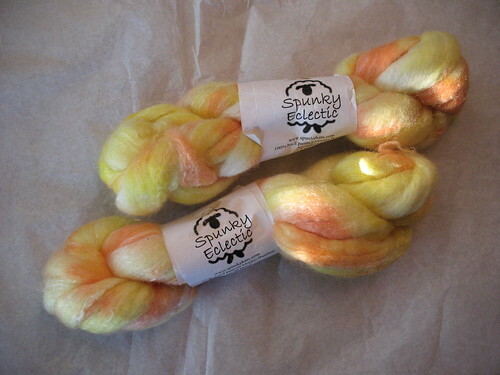 Also included in the package was 4 ounces of this amazing merino/bamboo fiber hand dyed by Spunky Eclectic. The colorway is Walking on the Sun, and it’s even more beautiful in person. 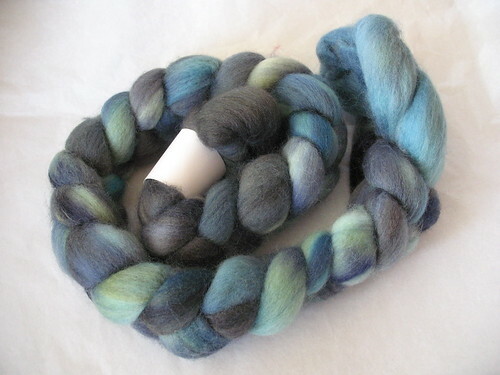 I haven’t spun it up yet, because I’m not sure how different spinning the bamboo fiber will be. 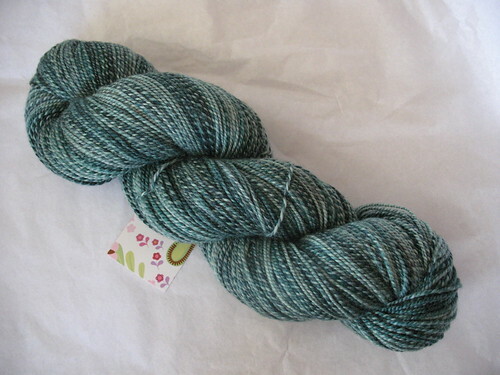 I’d like to have a bit more practice with the BFL and Corriedale I have in my fiber stash so that I don’t waste a bit of this. 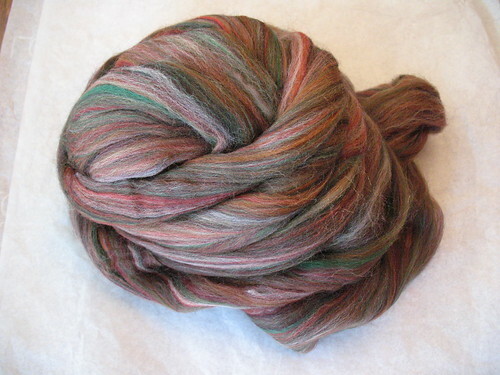 Since the first day, I have been inspired by the stunning yarn that Micki has been spinning on her Lendrum wheel. 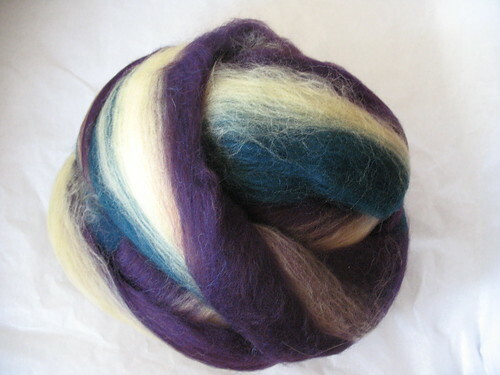 She has been enabling helping me by making recommendations of where I can purchase beautiful rovings to spin. 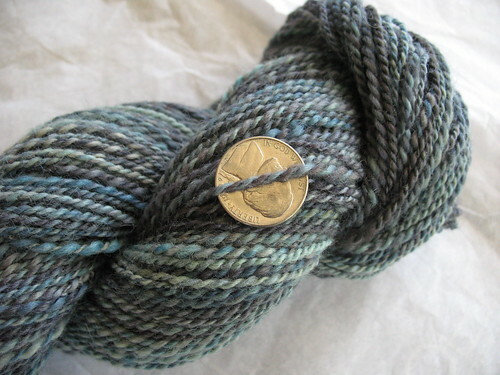 Within the matter of a few days, my doorstep was no longer being graced with packages filled with yarn, but with packages of rovings from Paradise Fibers, Wolly Treasures, and Crown Mountain Farms. 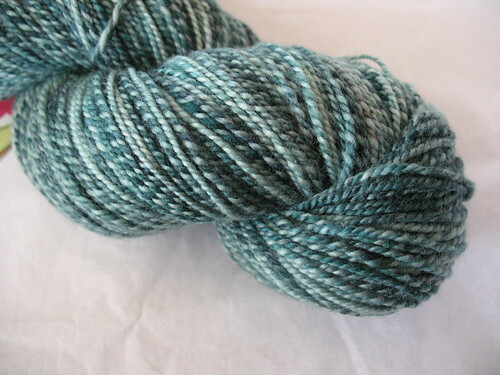 I’ve already started spinning the fiber from Paradise Fibers, which is 4 ounces of this beautiful Ashland Bay merino top in the Forest colorway. Photos of the other rovings will be shared as I spin them, but for those of you who don’t want to wait, check out my Flickr Spinning Set. I know it’s hard to tell, but lately there has been more knitting going on around here than spinning. The problem is, I can’t show you everything I’ve been knitting. 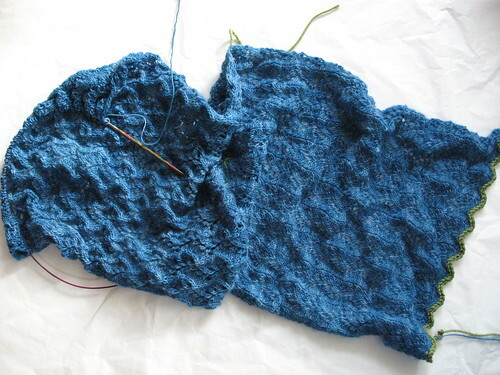 The only project I can show you is the beautiful blue blob which is another test-knit for my friend Laura. The project doesn’t have a name quite yet, and there will be two other knitters joining in, but since I was waiting for my sample knit pattern to arrive, I cast on and knit this as quick as I could. I’m only halfway through the stole, not including the border, but I have to stop now and work on the sample knits so it will look like this for a few weeks I’m afraid. 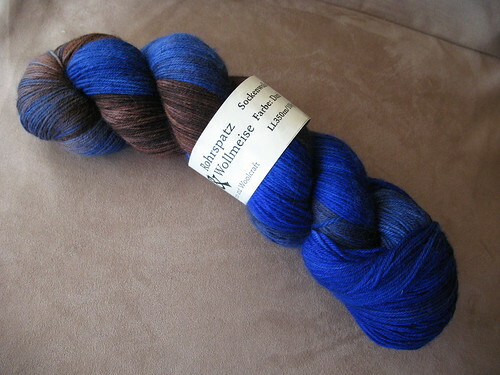 By the way, this is Malabrigo Lace yarn in Taureg, and it’s every bit as soft as the Malabrigo worsted in my stash. Do you know how tempting it is to knit lace undergarments in this? The knitting items I can’t show you are my sample knits. I met the designer at TNNA and told her I’d be thrilled to test or sample knit for her and after some email correspondence that followed, she agreed to send me a sample to knit as a trial to see how well we worked together and more obviously how well I could or couldn’t knit. When she received the first sample knit she said she loved it and asked if I could do two more for her this month. I feel so flattered and lucky to have this opportunity, and it has given my “cute knitting hobby” some credibility with family and friends since now I’m being paid to sample knit. Unfortunately for you, there will be no photos until the designs have been released. So currently I have two sock samples due by the end of this month and I’m trying to get them both finished before next Friday when I leave on vacation for 10 days. I’ve also made it to the next round of Sock Madness and the next round starts tonight. In fact the email with the pattern should be arriving in my inbox at anytime. 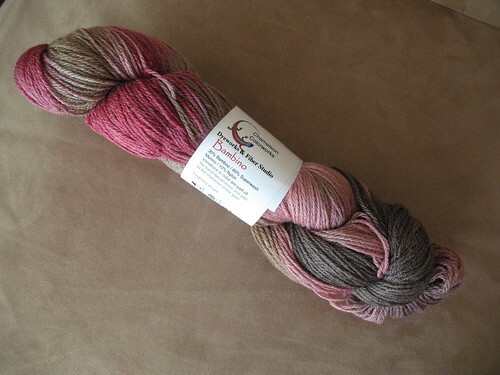 Oh crap, that reminds me, I’ve got to go wind those skeins of yarn which might take a minute or two or twenty since this round is a pair of socks in laceweight yarn in two different colorways. Yikes! Don’t even get me started on how much house cleaning, vacation preparation, emails, and voice mails that are being neglected. Aren’t you surprised I found time to squeeze in another blog post so soon? I’m still in my pajamas though if that gives you any clue as to what got skipped today so that a blog post could be written. You’re all worth it. 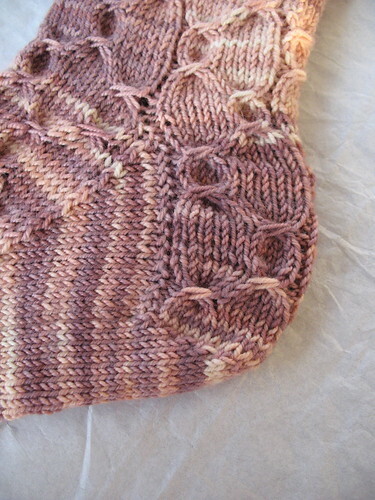 I would like to share with you the beautiful knitting project I completed Saturday morning, but I can’t. My grandkids spent the weekend with us and now today DH and I are both sick. The little one’s snotty nose looked innocent enough, but obviously he got the minor runny nose and gave us the rest of it … sore throat, headache, body aches, etc. So instead of a FO, I’m sharing with you my Garden Party Shawl “blob”. I’m sure most of you have seen this award floating around blog-land, but the most amazing thing has happened. I not only received the “You Make My Day” award, but I received it four times. I’m floating on cloud 9 so I won’t be back for awhile. My first award came from Hasbu at Hasbu’s Hideaway. Not only does she take the time to write her posts in both Finnish and English, but her beautiful handknits seem to fly off her needles. The next award came from Judy at Persistent Illusion. 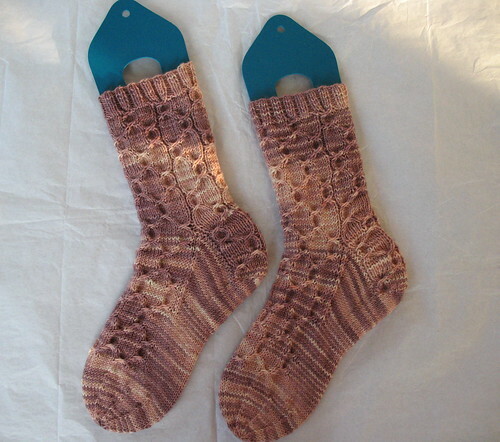 Everything Judy knits is amazing, and I tend to need to hide my credit card when I see her latest “yarn collecting” endeavors, but I especially love that she invented my favorite cast-on (Judy’s Magic Cast-On) and I find it quite interesting that she’s from my hometown. The third award came from Micki at A Thing For String. She has always enchanted me with her knitting, but just recently she started spinning and you’d never know she was a beginner. 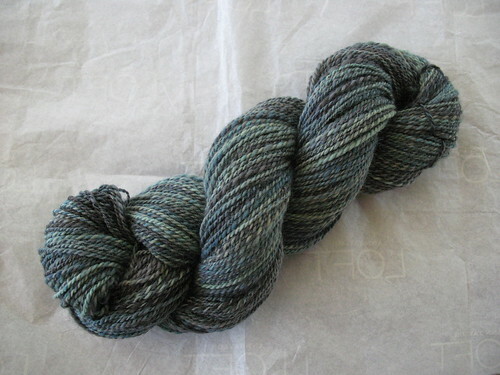 It looks better than some professional yarns I’ve purchased. My most recent award came from Angelika at Knit Wiz. Although she teases me with her secret knitting projects for KnitPicks, I still love to hear about her adventures in knitting, motherhood, and admire her for being a military wife. All of these women definitely make my day, and so I’m flattered to know that I make theirs too! Thank you. The official rules of this award are: Give the award to 10 people whose blogs bring you happiness and inspiration and make you feel happy about blogland. Let them know by posting a comment on their blog so they can pass it on. Beware you may get the award several times. Since I received 4 awards, that means I get to choose 40 blogs .. right? No? There are most definitely more than 10 blogs that make my day, so I’m using a random number generator. Pathetic? Well if you all weren’t so wonderful, this wouldn’t be so difficult. The A.D.D. Knitter Her knitting is fantastic, but I love her wit. I rarely read a post without giggling or smiling. 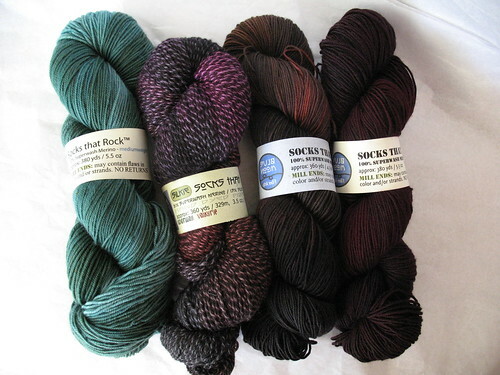 Pats Knitting & Quilting Socks, shawls, hats, gloves, sweaters, etc. She knits it all and makes it look so beautifully easy. ByFlutter She is a beautiful writer who inspires me to continue to better myself. Tiennie Knits Just seeing her completed knitting makes me want to be a better knitter (and photographer). Sknitty She has been my saving grace for dealing with FMS, but she also knits such beautiful things for herself, that it inspires me to do the same. Musings of a (mostly) Self-Taught Knitter She writes some of the most clever posts I’ve ever seen in blog-land. Fiber Dreams A talented designer, beautiful knitter, and a true friend. Just knowing her makes my world a better place. Carole Knits She shares herself, her knitting, and her family so openly, that I almost feel like she’s a long-distance friend. Knit/Wit There’s a lot I like about her blog, but I especially appreciate that she specifically shares what she does and doesn’t like about the yarn and patterns she knits. Yarn It – I’m inspired by her knitting, and amazed at how she ever finds the time to knit, blog, raise 4 kids, and go back to school for her nursing degree. 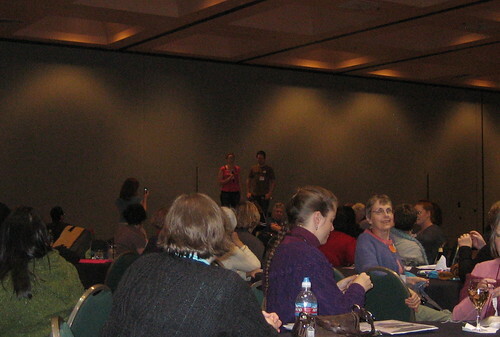 This was going to be a post about my adventures at TNNA in Long Beach, but it makes no sense telling you what I saw at this tradeshow, without first explaining why I was there. For those of you who are unfamiliar with TNNA, it is the National NeedleArts Association which is a trade association for professionals in knitting, needlework, and stitching. Each year they have two trade shows for members and it is huge! For our purposes, I’ll only discuss the knitting side of things. If you are a yarn store owner, a TNNA tradeshow is the perfect venue to go check out what’s new in the industry, place orders with vendors, meet designers, etc. So lets get back to why I was there. My dear friend Laura is a very talented designer and a member of TNNA. She graciously asked me to attend with her so she could meet with yarn companies, show them her patterns, and hopefully gather enough interest from them to possibly design some patterns in their yarn. It’s really a win/win situation. One of the items I was wearing on the 2nd day we attended was a pair of socks that she designed that I failed to post about when I finished them in November. 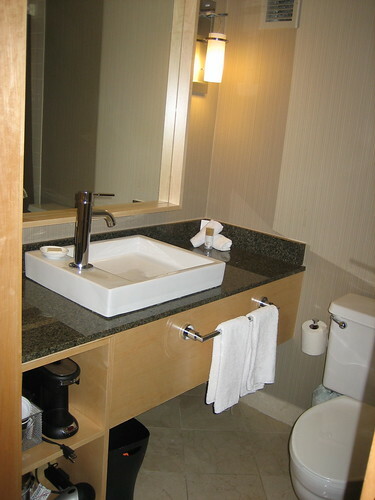 I’m going to remedy that problem right now because this is a pattern I definitely would like to show off! h the pattern, but because I was too lazy to swatch & realized when I completed the ribbing that I better go up a bit in needle size if these were going to fit. I also added an extra 1/2 repeat of the pattern on the leg because I’m somewhat strange and always like my socks a bit longer than any pattern I’ve ever knit. It seemed like a good idea at the time until I figured out that I had to shift my stitches on the needles to work the heel flap in the pattern stitch. It took some math skills on my part to make it work, but I think I executed it fine. Notes: The cabling technique in this pattern is beautiful and very unique and something I’ve never ran across before. 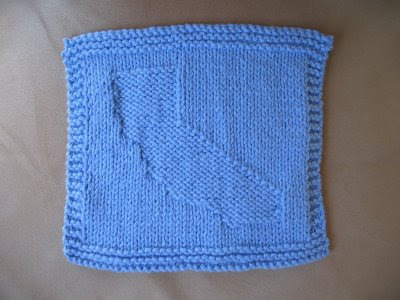 I was unable to figure out how to do it without a cable needle, but when I knit this pattern again, my goal is to figure it out. That is, unless someone does it for me first, which would be wonderful. 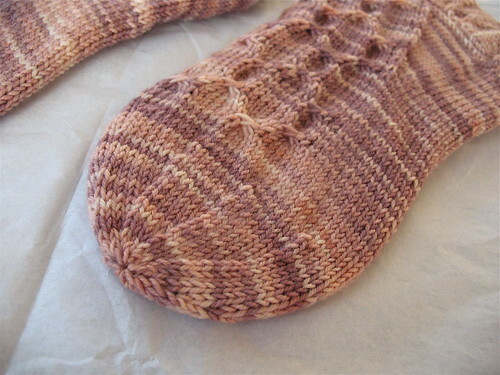 I don’t recall ever knitting this type of toe decrease before, especially since I usually knit all my socks toe-up, but it’s so pretty I felt it needed its own close-up. At TNNA I got compliments left and right every time someone saw these. In fact, the VP of Brown Sheep Company was practically gushing over them and said if they weren’t on my feet she’d steal them. The glint in her eye at one point led me to believe that she may indeed be serious. As can be the case with some patterns, you have to be careful as to what yarn type and colorway you choose, so that the stitch pattern doesn’t get “lost”. 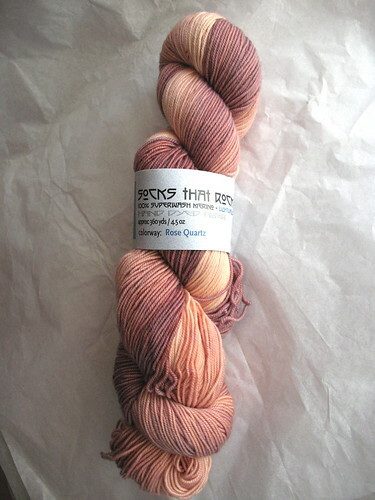 I think this skein of Socks That Rock showed off the pattern very well, and I was very lucky to win this skein in a blog contest awhile ago from Tiennie Knits. The pattern is written top-down (cuff to toe), on dpn’s, but I found it extremely easy to modify it for two circular needles. Dare I say that it would be just as easy using the Magic Loop? Now if this fabulous sock isn’t enough of a designer spotlight, I’ll tease you a bit here by showing you her current design that I’m test-knitting. 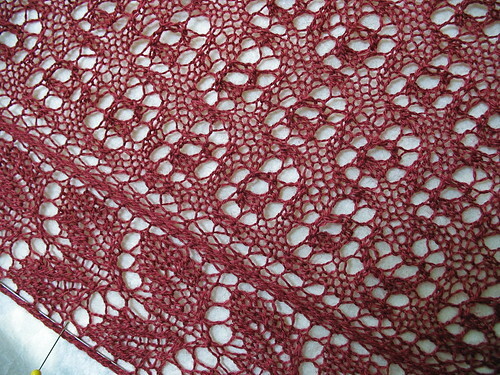 It’s called the Garden Party Shawl, and with all the beautiful flower and leaf motifs, I can definitely see why. 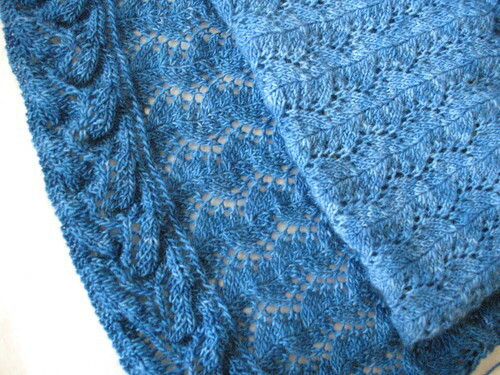 Some of you may remember her last design, Pacific Islands, which can be knit into a shawl or a scarf. It got quite a bit of attention when Wendy Johnson (Wendy Knits) test-knit it for Laura, and the pattern went flying out of Laura’s online store. 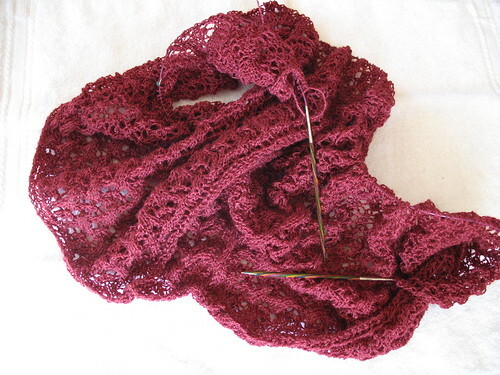 I suspect the Garden Party Shawl will too … once it’s available.